SIX SCENTED CANDLE CHRISTMAS GIFT SET PACKAGED IN A PREMIUM PAISLEY PRINT GIFT BOX, tied with a gold bow, will make a perfect present for a birthday, anniversary, house warming or as a thank you gift. INCLUDED IN THIS PRESENTATION PACK IS; 1 x Lemongrass, 1 x Lilac Blossom, 1 x White Tea, 1 x Mango and Coconut, 1 x Sweet Jasmine and 1 x Black Cherry scented candles. 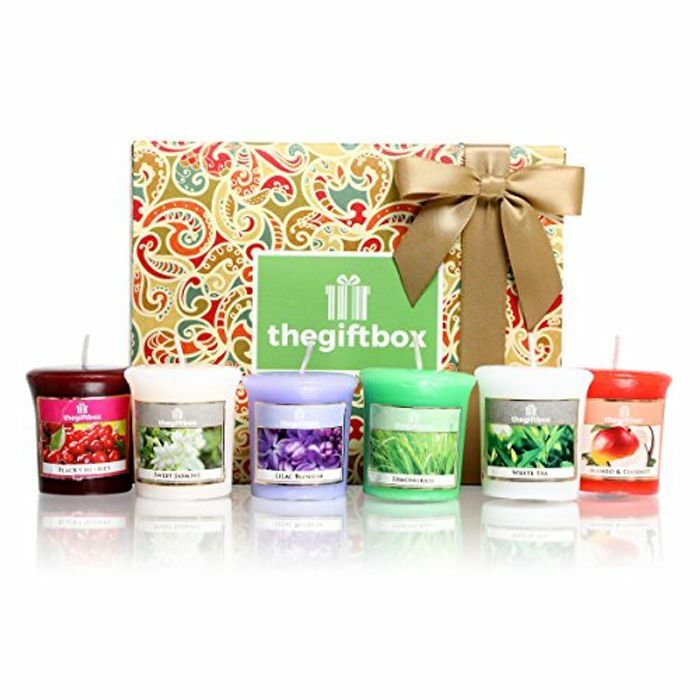 SCENTED CANDLES MAKE THE IDEAL women's gifts whether you're after 30th birthday gifts for women, 40th birthday gifts for women, 50th birthday gifts for women, best friend gifts for women, birthday gifts for mum or wife gifts. WE PRODUCE THE ULTIMATE HIGH QUALITY SCENTED CANDLES FOR WOMEN, plus see our other product ranges on sale, which include luxury scented candles, christmas gifts for women, women's gift sets, scented candle gift sets and couples gift sets. We have plenty of gifts for women, birthday gifts for her and other scented candles large in size. Great deal, thanks for sharing.